Knowledge is the backbone of a Salem character. Without it, the character will not get very far crafting-wise. The system might seem daunting at first glance but is relatively easy to learn. The difficult part is to remember what kind of item you need to study to get that last bit of points to level up or learn a skill. 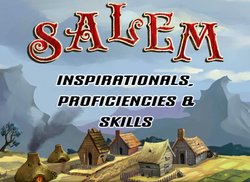 Before we delve into how knowledge work I would like to recommend reading up on what kind of game Salem is and also the type of game client I currently recommend. Descriptions in this article are based on that client. Purity is covered in this article. Studying an item drops the learning ability to 70% (displayed in the skill menu). Studying the same type of inspirational will make the learning ability drop lower. Studying a new inspirational returns the ability to 70%. With that said, it is better to study different items than study the same kind over and over. Some of the early game ‘inspirationals’ are listed below. The basic knowledge in Salem is proficiencies. The higher the number, the more effective the character becomes. Currently, 5 of the 15 proficiencies have an increasing effect on tasks done the higher their number is. For instance, the higher Stocks & Cultivars, the more crops can be gained when harvesting fields. When a proficiency bar has filled up, click it to increase it 2 points. If you have additional full bars you will increase those proficiencies 1 point. The exception to this rule is Perennial Philosophy. It will increase 1 point only when its bar has been clicked, and any other full bar will NOT increase their corresponding proficiency. Also, if Perennial Philosophy have a full bar when another full bar is clicked, it will not increase its value. It’s worth noting that the skill menu list proficiency numbers in the hundreds but are actually one 100th of it. So 2500 Stocks & Cultivars is in reality 25 points. If a character gets knocked-out it will lose 1 point in 2 random proficiencies. So try to avoid that. Tip: It may be a good idea to fill up all bars (except Perennial Philosophy) before levelling up to avoid “waste”. There are close to 90 skills to learn. Learning a skill opens up more crafting and fighting options, as well as emotes. Looking at the picture we see that learned skills are listed in white in the ‘Current’ box. ‘Available’ skills have yet not been learned. They are shown in pale red when the required proficiency points are too low, while skills in yellow can be learned. Selecting a skill shows the required amount of proficiency points needed as dark red bars. If higher proficiency is required the bar will be bright red (not shown in picture). Blue bars are already acquired points while pale red bars are what the character is about to learn. Hovering an inspirational shows the points it gives as yellow bars. If a bar is green it means that that proficiency can be levelled up. The plus signs are the developer’s way of showing what can be levelled up. If you have enough points to learn a skill, click ‘Buy’ to learn it. All bars will then be depleted. Should I learn all skills and improve all proficiencies or not? That is entirely up to you. Many players have several characters, myself included, with varying abilities mainly because it takes time to make a “über character” – one that has learned everything. If that character dies it will be a massive blow to the player. Players teaming up with each other will, in theory, need less alternative characters, because each member of the team can specialize in specific areas – farmers, miners, raiders etc. But for those who want to play it safe it’s a good idea to have more than 1 character. Ah I misunderstood you then. That would be interesting. To be a true "veteran". On the other hand, if using RS as an example, there might be new players coming along who likes nothing more than to bash said veterans for whatever reason. I was thinking more of being there at the inception, rather than the look and feel of it. I know all of those years in Runescape, there was a certain kudos attached to those who had been there since Classic. Give it 3 or 4 years and you're going to have a similar kudos in Salem. I have very little experience with RuneScape Classic. I checked it out during one of the temporary openings in 2010 or so, and I just couldn't play it. Not after 5 years of "normal" RuneScape. In my opinion, Salem looks and feels better than Classic. This is like joining Runescape during Classic, isn't it? I love how the proficiency chart is set out.